How to do correspondence analysis with R in Tableau? How to do correspondence analysis with R in Tableau? If succeed, we can get a graph like below. Could you kindly give some suggestion to plot this graph? Thanks. 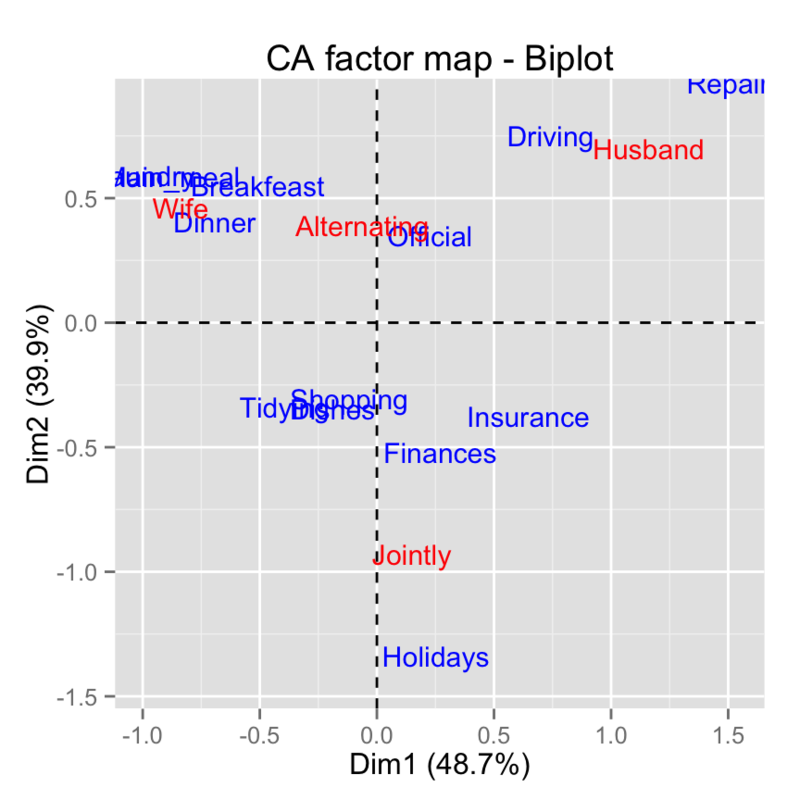 However, this biplot tutorial never seen. Thank for your help! 1. Re: How to do correspondence analysis with R in Tableau? 2. Re: How to do correspondence analysis with R in Tableau? I have read many your post, However, the answer is hard to find, it is so heartwarming if you can help me. 3. Re: How to do correspondence analysis with R in Tableau? I can't tell if your question is about a) how to do this kind of statistical analysis, b) how to do this in R, or c) how to get Tableau to display what you've computed in R. For a) and b) I suggest you go to an R forum for that. If your question is about how to integrate R with Tableau then I suggest you start here Tableau and R Integration and then if you have questions then post a Tableau packaged workbook (.twbx) with some sample data and details about what exactly you are trying to do and the particular issue(s) you are trying to solve. 4. Re: How to do correspondence analysis with R in Tableau? Thank your advice, I have edited my question. 5. Re: How to do correspondence analysis with R in Tableau? All you provided in the TWBX is a data set. I’m sorry, but when it comes to a question like this involving R code that I’ve never used before I’m not able to help***. My suggestion would be to use this data in R and get the analysis working there (i.e. learn the R libraries that you need and get them working for you) and then you can come back to the forums for the next steps to get it working in Tableau. 6. Re: How to do correspondence analysis with R in Tableau? I wrote about it here. You can also find a sample workbook. The issue with correspondence analysis is that you want to plot both row variables and column variables on the same chart e.g. in the chart below Volvo and Safety. This means if you have 10 products and 5 answers to the survey question, you are displaying 15 points in a chart while your table only has 10. The post uses a workaround to make this work so the R code may look a bit complicated. I also did a multiple correspondence example in case you have multiple survey questions or other categorical variables.